This luxury tea infuser is great for making a nice cup of tea! Easy to use! Just remove the Silicone (100% BPA-Free, 100% Plastic-Free, 100% Safe) from the Stainless Steel Bottom. Fill the Stainless Steel Bottom with a teaspoon full of tea (Adjust amount to your liking), reconnect the Silicone Top with the Stainless Steel Bottom and immerse your Infuser into a Medium to Large Cup of hot water. Easy to Clean! Just dispose of the used tea leaves and rinse with warm soapy water. Oh, and its dishwasher safe! The Stainless Steel Base will have a MINIMAL amount of tea leaves seep through the holes while steeping if the tea leaves are ground very fine. Your feedback is very important to us in providing the best quality products. Please leave a review or ask any questions you have about the product. Easy to clean and Dishwasher Safe! Don't stick in a Microwave though! Makes enough tea for a Medium to Large Sized Cup at Home, in Office or anywhere you like! Effectively steeps fine loose leaf tea with a miniscule amount of those extra fine tea grounds at the bottom of the cup. 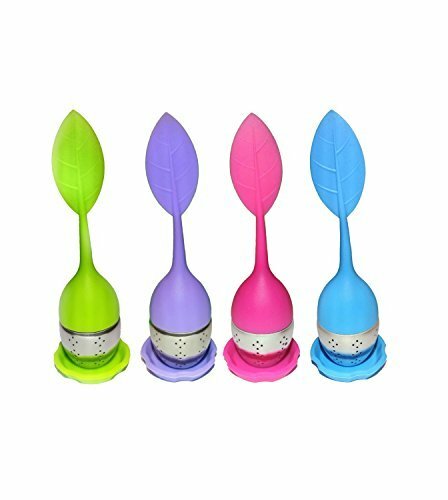 The infuser stands at 6" tall and has sufficient room to allow the loose leaves to absorb water and expand, which is necessary in the infusion process. If you have any questions about this product by Cozy Brew, contact us by completing and submitting the form below. If you are looking for a specif part number, please include it with your message.